My Verizon, A personal assistant that unlocks the best of Verizon. Verizon is America's largest wireless provider and has helped create a world where every service imaginable is available on demand. In the connected age, everything is instant. It's an expectation that's left traditional customer service models behind. AKQA Team: David Clarke (Group Creative Director), Munawar Ahmed (Group UX Director), Ekin Seker McLean (ACD), Khoi Phan (Senior Art Director), Gabe Beck/Rusty Perrett (Senior User Experience), Juan Pacheco (Analytics Supervisor), Amir Aziz (Project Manager). Intelligent and easy to use, the My Verizon app meets the needs of 100+ million subscribers, providing complete self-service through its intuitive, instantaneous design and conversational interface. Featuring a simplified bill, personalised control centre, on-demand support and shopping functionality, the new app has achieved record-breaking sales, customer satisfaction and loyalty. 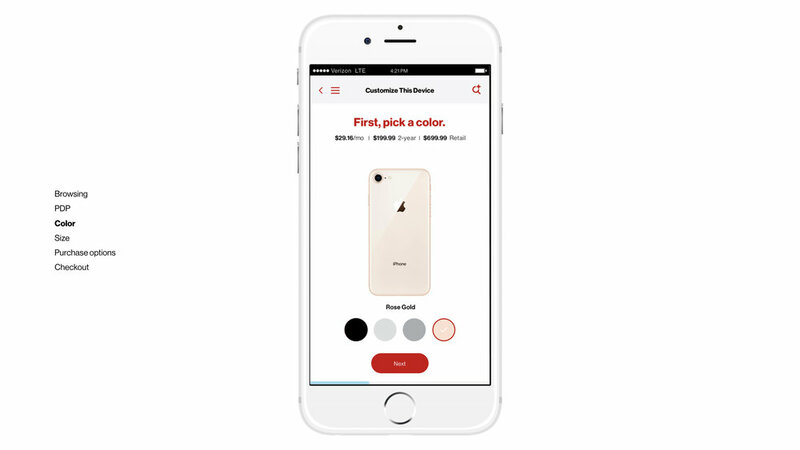 My role was to lead the design and UX of the app's Shop experience by creating a revolutionary purchase flow. Our flows were validated through extensive rounds of design and rigorous user testing. This project was Verizon Wireless' number 1 priority in 2016 - 2017 with the Shop being the focal point of Verizon's new customer experience. Within seven months of the app’s launch, Verizon’s mobile sales conversion rate rose 15.6x, and overall usage is up over 50%. Bill payment within the app increased from 68% to 85% and is buoyed by a 27% lift in autopay enrollment. The new app gives the network’s 113 million customers more control, with less work, all in the palm of their hand.